The Damage Assessment Team (DAT) confirmed Discovery’s clean ascent into space by clearing the orbiter from a Focused Inspection, as STS-133’s mission continues to proceed flawlessly. With a host of robotic operations picking up shortly after Discovery arrived at the orbital outpost for the final time, the crew are heading toward the opening spacewalk – to be conducted on Monday. Despite a 40 minute delay in hard-docking Discovery to the Station on Flight Day 3, STS-133 crewmembers Mike Barrett and Nicole Scott completed their robotic operations to translate to Express Logistics Carrier 4 (ELC-4) from the orbiter’s Payload Bay (PLB) to the Starboard Truss. Flight Day 4’s main activities included operations involving three of the Canadian robotic arms, as the Orbiter Boom Sensor System (OBSS) was handed off to the Shuttle Remote Manipulator System (SRMS) by the Space Station Remote Manipulator System (SSRMS) – prior to the Station arm translating to a base change. The majority of the crew also began transfer operations between the two vehicles, interrupted by a public affair event, prior to entering into EVA-2 preparations – ahead of Monday’s 6.5 hour EVA-1 to be conducted by Alvin Drew and Steven Bowen – later in the day. Discovery’s historic docking – her last prior to retirement – was flawless from an orbiter standpoint, as the veteran ship’s systems all worked as advertised, bar a minor Ku-Band glitch – which were quickly resolved. “RNDZ (Rendezvous) timeline block 4A RADAR self-test was started at GMT 057/13:41:11 (MET 001/15:47:47). Ku-Band system failed Self-Test due to an expected task 8.3 beta angle rate fail. The Crew put the system in the Comm mode at GMT 057/13:47:54 (MET 001/15:54:30) and the system is operating normally,” noted summary sections of an expansive MER rendezvous and docking summary (L2). “The Crew put the system in the RADAR ON for RNDZ at GMT 057/15:49:14 (MET 001/17:55:50) and detected ISS at a range of 143 kft (GMT 057/15:49:30), tracking at 142 kft (GMT 057/15:49:50). RADAR operated as expected. The crew returned the Ku-Band to COMM mode at GMT 057/18:43:52 (MET 001/20:50:28) at a range of 320 ft. Discovery then joined to the giant station she helped construct over the latter part of her esteemed career, confirming soft dock after she arrived via a mix of human and computer expertise. “Capture occurred at about GMT 057/19:14:33. Hooks closed at GMT 057/20:40:56. DAP (Digital Autopilot) was moded to LVLH at GMT 057/20:09:54 and the maneuver to the TEA (Torque Equilibrium Attitude) began at GMT 057/20:12:00. The maneuver was complete at GMT 057/20:42:15,” added the MER notes. Once soft docked, the adjoined vehicles went into a previously experienced condition caused by “gravity gradients” – which impacted on the alignment of the guide ring, delaying the move to a hard dock condition until the relative motion eased out. 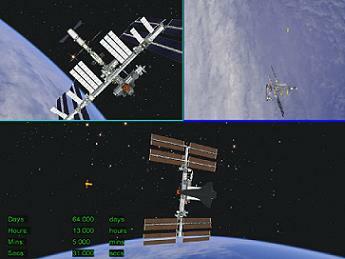 “ODS (Orbiter Docking System) performed within specifications. During Stuck Dampers procedure, oscillation of petals 1 and 3 (around petal 2) was observed. Guide Ring misalignment indication was obtained at GMT 057 / 19:26:02 (lasted 2:01) at guide ring position 38 percent,” added the MER report. “Another Guide Ring misalignment obtained at GMT 057 / 19:28:07 (Guide Position at 34 percent). The ISS / Shuttle system entered gravity gradient conditions causing the guide ring positions to diverge for approximately 23:56 before final guide ring retraction could be re-initiated. This scenario has been observed before (i.e., STS 130). Cryo margins on the orbiter have also been assessed as supporting two extra days – if required – one of which would be used if managers decide to extend the docked mission by one day to facilitate the Soyuz flyabout, which remains under discussion for later in the mission – mainly on the Russian side. All of Discovery’s systems continue to perform admirably, with the Mission Evaluation Room (MER) only having to evaluate a couple of minor issues – one of which is related to the amount of water gathered from the humidity in the crew cabin on Flight Day 1, and a “funny” (minor issue) observed on hardware related to the SSPTS (Station to Shuttle Power Transfer System). “Mission Status: Vehicle continues to perform nominally. 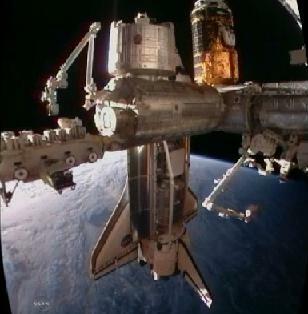 Discovery is now docked to ISS. New Problems and Funnies: MER-01 Hum Sep Water Carryover – this item was upgraded from the funny list at the FD3 OPO (Orbiter Project Office). The crew has not observed any additional carryover water since FD1,” noted MER documentation (L2). As was expected, following an incident free ascent last Thursday, the DAT engineers have been confronted by a very clean orbiter Thermal Protection System (TPS), as they evaluate the array of photography and data gained from the Flight Day 2 OBSS inspections, along with the Flight Day 3 RPM footage. (Numerous DAT presentations/video available in L2). Although some media focus was placed on the visible foam liberation late into Discovery’s ascent, managers were already of the opinion the incident was of no concern due to the lack of aerodynamic transport available to such debris when the orbiter is outside of the first stage environment. Such is the vast understanding of liberation events, it was no surprise when the DAT engineers confirmed zero damage in the area of “impact” – or more accurately a small piece of foam lightly bouncing off the TPS – as seen via the camera on the External Tank (ET-137). 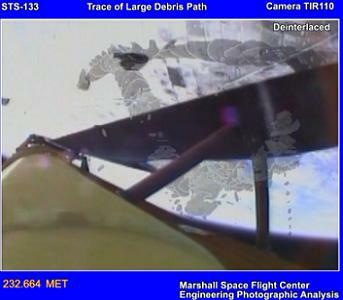 (Image used shows the how the debris floated and bounced around, as opposed to “striking” the orbiter). “The LESS/RCC team has completed review and dispositioning of all RCC ROI’s (Reinforced Carbon Carbon – Regions Of Interest). None of the ROI’s were found to exhibit damage characteristics. The team was unanimous with review of the items. No focused inspection is required for any of the RCC ROI,” noted one of the opening statements from DAT on their stance for any requirement of a Focused Inspection (L2 ). “TPS is in the middle of reviewing RPM imagery. Overall the vehicle looks in very good shape. Only one small tile damage (forward of port inboard elevon) has been added to the previous list for assessment. No damage was identified on or around the NLGD (Nose Landing Gear Door) where the foam was noted to impact during ascent”. 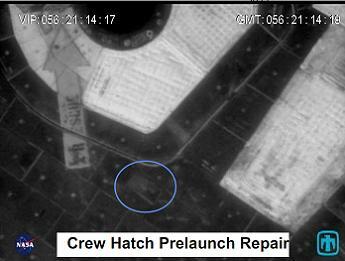 The DAT engineers also provided confirmation the work from the closeout team at the pad provided a secure repair to a very small area of coating damage, sustained during the closure of the hatch on launch day. With a think black paint substance used to cover the defect, on orbit photography showed the repair was highly satisfactory. The official clearance of Discovery for entry is expected early in the week, as the DAT go through a process known as a Level II Review, followed by a Peer Review – a failsafe to ensure nothing has been missed by the engineers. This also allows time for further analysis to be completed on any potential gap fillers – of which there has only been one spotted via the RPM photos – on the RH MLGD (Right Hand Main Landing Gear Door). As always, numerous photos of what is nothing more than cosmetic damage to two of Discovery’s 26,000 tiles were produced by the DAT as part of their report to the Mission Management Team (MMT). Because such photos are blown up in size for assessment by the DAT, images of extremely minor damage can sometimes be misinterpreted by people outside of the program. MMT chair LeRoy Cain appeared to intimate such a scenario during Sunday’s media briefing. “I’m happy to report there wasn’t really much to talk about at all. Literally we had very few areas where they were able to detect any damage at all. We had two tiles, on the entire bottom side of the orbiter – where we have thousands of tiles – and it’s just coating damage,” noted Mr Cain. “Just phenomenal performance from the Space Shuttle system to result in this kind of a report from the inspection team. “We like to show you pictures of damage and talk about why it’s not a concern. (Howver,) I’ve decided not to show the pictures as it’s such trivial damage, and it was then pointed out to me that it was a good point to make.” (In compliance with Mr Cain’s opinion, those photos are also omitted from this article). Engineers will continue to monitor the vehicle’s Wing Leading Edges (WLEs) via the monitoring on the WLE IDS (Impact Detection System), ahead of one final inspection of the orbiter after undocking via the OBSS. Using the FD2 and FD3 data as a baseline, Discovery will be given her final clearance for entry shortly after those inspections have been downlinked to Houston. (Numerous articles will follow. L2 members refer to STS-133 live coverage sections for internal coverage, presentations, images and and updates from engineers and managers – which is now into full Flight Day coverage during the mission. Images used, lead: NASA.gov. Stitch by Ron Smyth Rest via L2 documentation).